To extend the analysis of Chalara’s ability to degrade wood and thus invade a tree directly I examined the lignin-decaying gene complement in the genome. The previous work on identifying decay related enzymes in [Floudas]: http://dx.doi.org/10.1126/science.1221748 was used as a base. 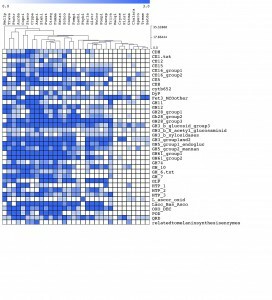 The list of proteins in the TGAC 1.1 KW 1 genome assembly of Chalara fraxinea and the list of wood decaying proteins in Floudas were used as input to BLAST searches to identify proteins with strong sequence identity in the Chalara (see [protocol]: https://github.com/danmaclean/h_pseu_analysis/blob/master/interesting_wood_gene_analysis.md ). For each group in the Floudas decay-related list Chalara proteins were assayed to identify proteins in the with >50% sequence identity to the representative protein in at least 10 members. Counts of the number of Chalara proteins passing this threshold were used as the estimate of the number of members of each group in the Chalara genome. The analysis shows that the Chalara genome is in fact very poor in the sorts of enzymes that are typically used by wood rotting fungi to decay the wood.